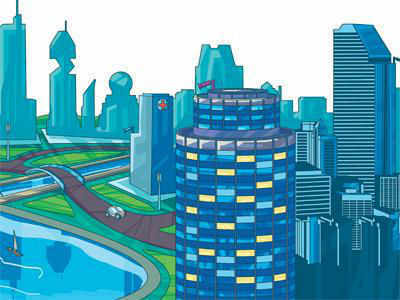 VIJAYAWADA: The historicVIJAYAWADA city will soon have a new icon in the form of a City Square that will be built under the public-private partnership initiative at the Swarajya Maidan in the heart of the city. Guizhou International Investment Corporation of China (GIIC) has designed the City Square that will come up on a five-acre land at an estimated cost of Rs 135 crore. Andhra Pradesh (AP) chief minister N Chandrababu Naidu approved the design on Sunday at a meeting attended by water resources minister Devineni Umamaheswara Rao, Krishna district collector Babu A, municipal commissioner G Veerapandian and representatives of GIIC. "The City Square will be a jewel in AP's crown and be a large tourist attraction," Naidu said on the occasion. Vijayawada, the second largest city in AP, is currently serving as the "functional capital" of the state. The proposed City Square will have shopping complexes and a stupa depicting the heritage of the region. An underground parking lot will also be developed.